My dad probably didn’t know how special he was. His impact on my life was beyond measure. But, in being faithful for a lifetime of manly responsibilities I think he probably felt like he was “just-a” dad. There is no such thing as a “Just-a” D ad. A dad is a dad. 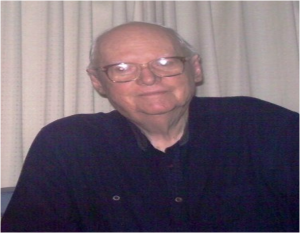 He is a vitally important figure in the life of his children, his family, his church, his community and his world. AGE tempts a man to think he is “Just-a” dad. MONEY tempts a man to think he’s “Just-a” dad. DISRESPECT tempts a man to think he’s “Just-a” dad. “Can’t you do anything right? DOUBT tempts a man to think he’s “Just-a” dad. There is an overwhelming tendency for a man to have the wrong scoreboard on the value and impact of his life. These questions can get inside a man’s thinking and corrupt his belief and feeling about his value. There is an answer for all of those questions and a solution to the “Just-A” Dad syndrome. “Your life matters.” It matters because God says it does. Then you are in a lot better place to face those challenges and you are not diminished as a dad. Your credibility, wisdom and strength increases in your own mind but also in the eyes of your kids. You can make the impact a dad is supposed to make on his kids. You can bless your children. The Blessing, by John Trent and Garry Smalley, is a must read for dads. If you don’t read it, at least pay attention to the power of blessing. 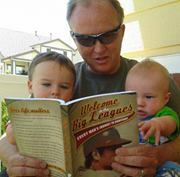 I refer to the book in the 2nd inning of Welcome to the Big Leagues—Every Man’s Journey to Significance. Trent and Smalley identify 5 elements of a blessing…. A spoken (or written) message. Whatever your age, income, struggle, you can do this. Don’t let the “just-a” dad competition knock you out of the game. Bless each of your children and you will know your life has mattered to them. You will be the conduit that God has flowed through to pass on the blessing to them. As my sons raise my grand-buddies, I pray they never fall in the “just-a” dad trap. We can put our sons and daughters in the prayer below. Lord, may ______________ never have to search for words or be left wondering if he/she is of value to us or to Your. Help me to bless him/her Lord—with my words, with my actions, with my whole life. Remind me not to leave my words to chance but to choose to bless ____________ all the days of my life. In the name of Jesus, from whom all blessings flow, amen. (Also from The Blessing). You are not “just-a” dad. You have the God given place in life to strengthen and fulfill your children’s life with the blessing of God. Your life matters.